President David Granger and outgoing Argentine Ambassador, Mr. Luis Alberto Martino at State House. President David Granger was paid a farewell courtesy call on Thursday, by outgoing Argentine Ambassador to Guyana, Mr. Luis Alberto Martino. Ambassador Martino will be replaced by Dr. Felipe Alejandro Gardella, whose appointment was approved by Cabinet last month. 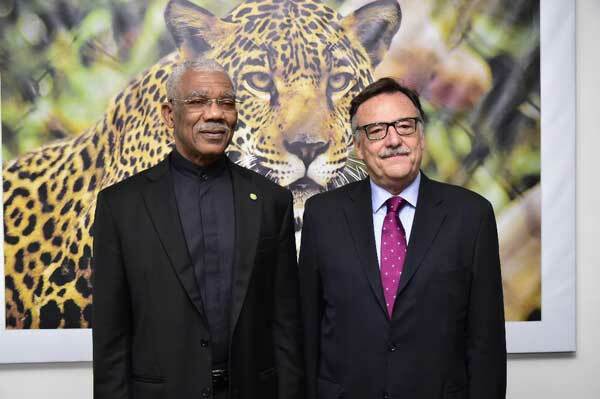 Meanwhile, Ambassador Martino, who spent the last six years in Guyana, said that of all his postings in his long career as a diplomat, he has developed a close connection to Guyana, so much so, that he is sad to be leaving. He also said that he is pleased with the level of cooperation that the two countries have shared over the years, particularly as it relates to the Argentine Embassy’s work with the National Gallery and its involvement with the restoration and conservation of artwork. Ambassador Martino also assured that he will, upon his return to Argentina, suggest a State visit to his Government, in an effort to intensify exchanges between the two countries. Guyana and Argentina established diplomatic relations in October, 1972.